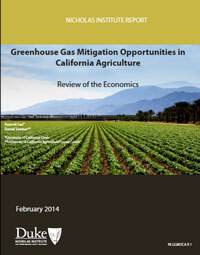 Although about three-quarters of California farm revenue derives from crop production, crops—mainly tree, vine, and vegetable crops—account for only about one-quarter of GHG emissions. Some studies indicate minimal yield loss from reducing nitrogen fertilizer use, and simulation results show significant percentage reductions in GHG emissions for payments of $20/MTCO2e. The economics of reducing emissions from enteric fermentation has been little studied. Manure management to reduce GHG emissions (mainly methane) can be as simple as covering manure lagoons and flaring methane. The more complex option of using manure-generated methane gas to replace fossil fuels has been investigated often. Most case studies and simulations suggest this option is costly. Its economic feasibility depends on specific local conditions, but there is no evidence of large-scale feasibility in California without large subsidies.